The ITF logo on one side and the Phoenix logo on the other side. This is our event of the year! 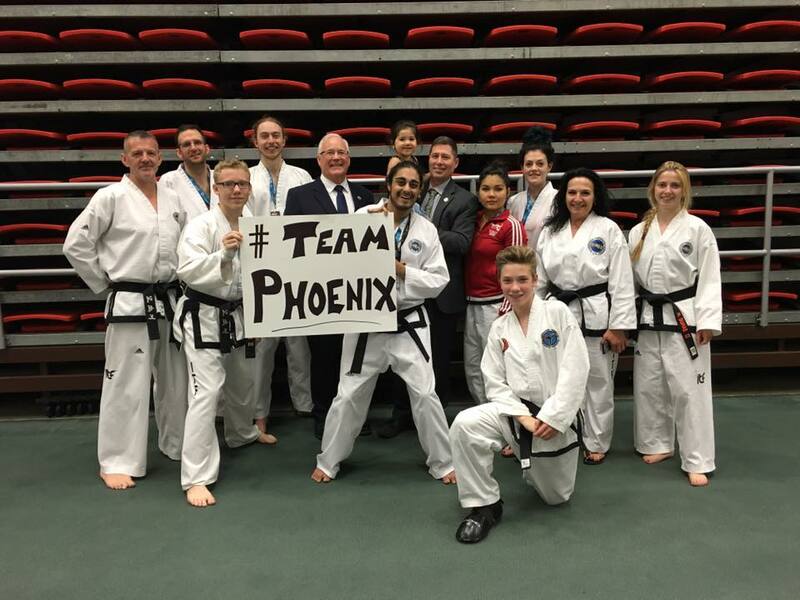 our students get to showcase their skills at the annual Phoenix Taekwon-do Tournament. Of course all other Chang-Hon stylists from other clubs are welcome to attend too! Edmonton Garrison Field House - 185 RR 244, Edmonton. ​Directions:. Off the North leg of the Anthony Henday, go North on 97 St. First lights turn right, next lights turn right. 3rd lights turn right. Go through the next lights and turn right at the following lights. Turn into the parking lot of the field house. (right). We LOVE this event! 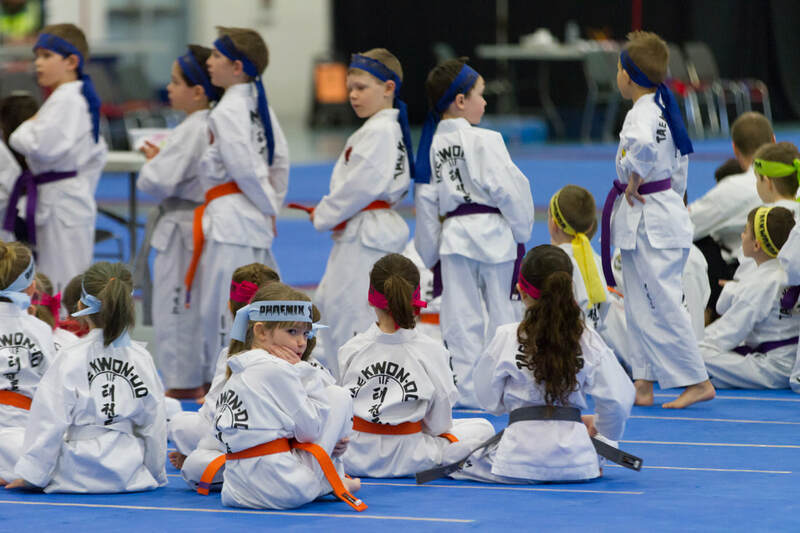 The Shadow Warrior Obstacle Course gives our youngest Taekwon-doists the opportunity to showcase their kicks, punches, rolls, and best ninja moves in a timed obstacle course. 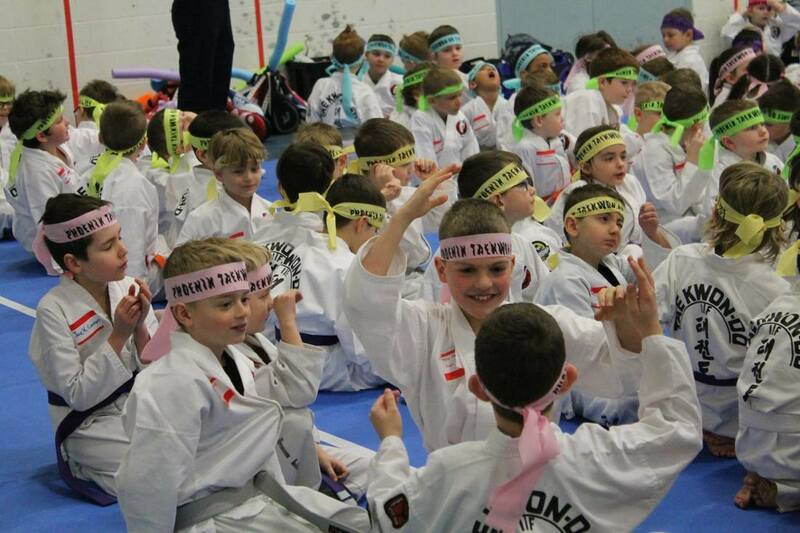 All the participants receive cool Ninja Headbands as a keepsake for the event. They also get to break boards (styrofoam) - a Shadow Warrior favourite! The 3 fastest times in each age/gender group will get a tournament medal, Gold, Silver and Bronze!!!! Parents, this is a super fun morning for your Shadow Warrior! We have the Shadow Warriors compete in the morning, so you will be finished before lunch - we want to be respectful of your time, so our team is super efficient. Shadow Warrior Obstacle Course: This will be a timed event. Divisions will be divided into age groups and gender groups. All competitors will receive ribbons. There will be additional certificate awards for the best etiquette. The 3 fastest times in each age/gender group will get a tournament medal, Gold, Silver and Bronze!!!! 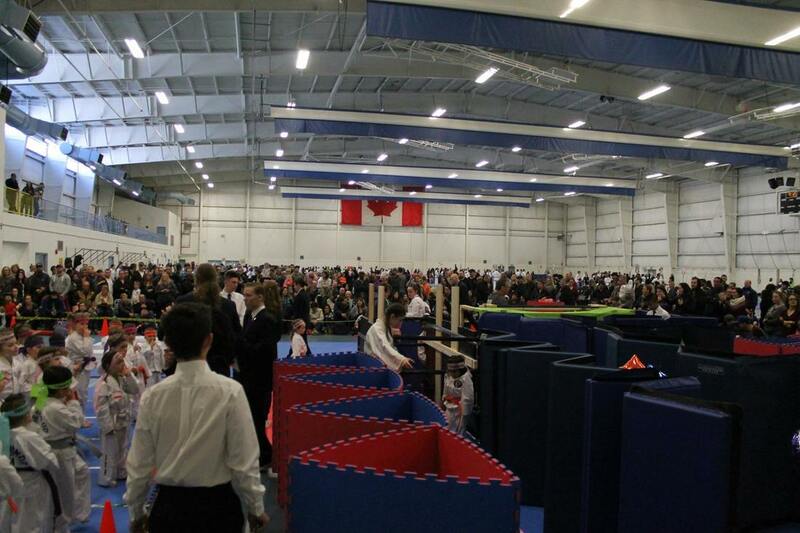 The course will consist of crawling, jumping, running, dodging and of course some kicking. 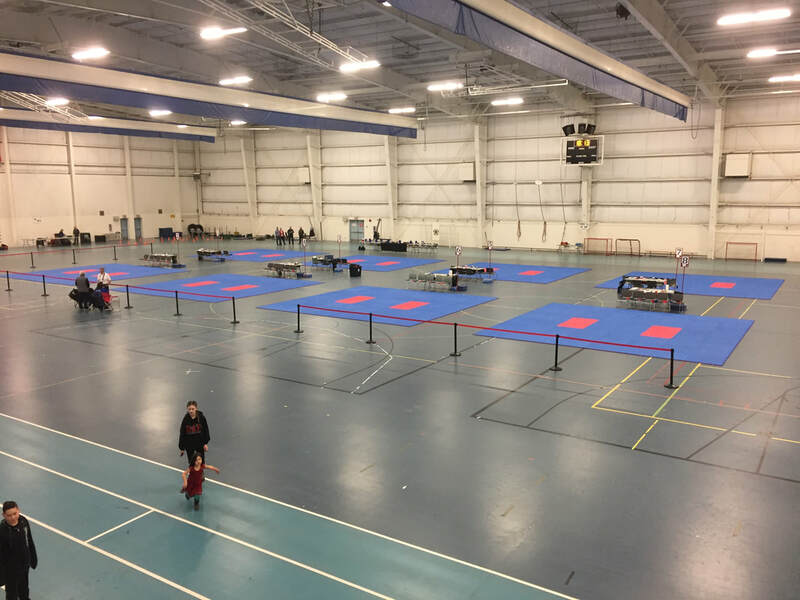 The Shadow Warriors will be the first event called to compete Saturday morning. Shadow Warrior Board Breaking: This event will start with a kick on a paddle. 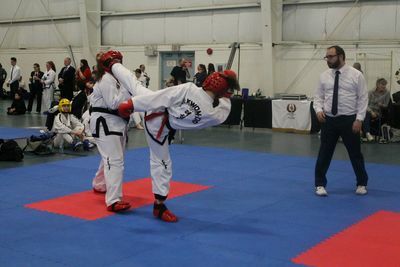 The more technically correct technique will advance to the side kick or front kick break. The others will go to a stomp kick break. Divisions will be the same as the obstacle course. This shows 8 of the 10 rings at the venue. There is a lot of space for everyone to watch from. Bring a chair to sit in, just like soccer! Saturday 9:00 am. Doors open at 8 am. Parents & Spectators: Please note that spectators are standing room only! Feel free to bring a mat or folding chair to sit on. Set up: Friday night 4:00 pm all assistance offered will be warmly welcomed. 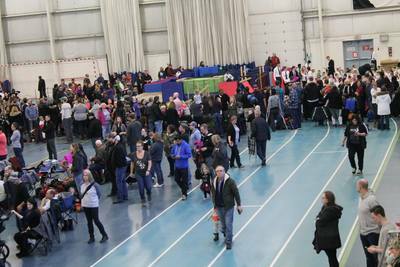 Spectator fees: FREE ADMISSION ! Meals: VIP guests, referees and judges will receive Subway sandwiches and water starting at noon. 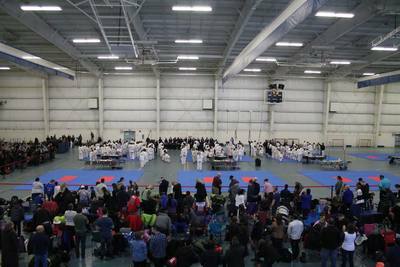 Address: Edmonton Garrison Field House - 185 RR 244, Edmonton. Directions:. Off the Henday go North on 97 St. First lights turn right, next lights turn right. 3rd lights turn right. Go through the next lights and turn right at the following lights. Turn into the parking lot of the field house. (right). Bring your sparring gear when you are called to the on deck area! Remember; clean up after yourself and your friends! Use the garbage cans for garbage! Patterns: ITF pattern rules apply. Single elimination to the final round. Divisions will be by age, gender and belt level. Division of 2 or less will be folded into another division. Colour belts will perform a pattern of their level or one level below. 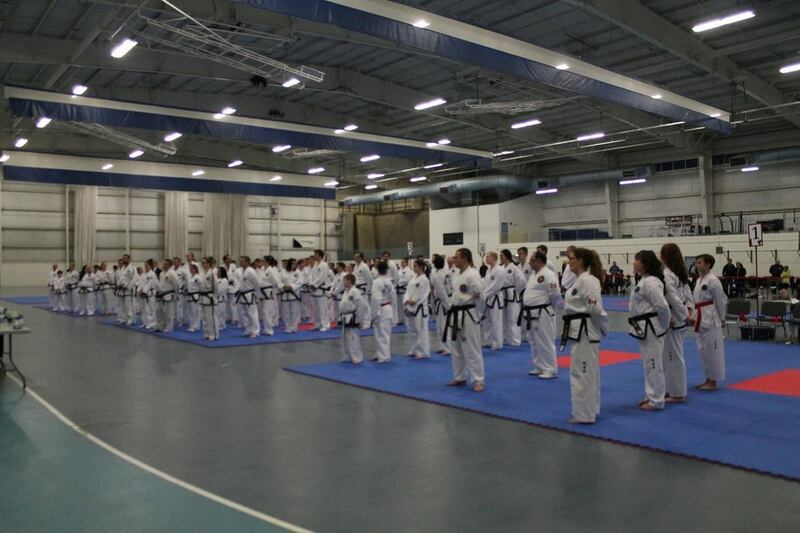 Black belts will perform one pattern of their level or one level below. Black belts will perform a second pattern of the judges choice for the gold/silver round. 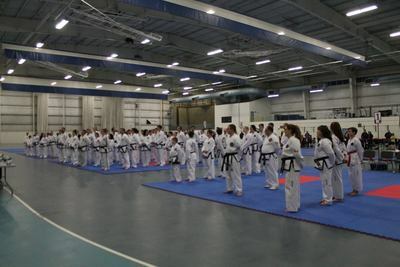 2 competitors are called and will perform their pattern at the same time. Judges will raise coloured flags to indicate their choice of winner. The competitor on the judge's left is always red, the one on the judge's right is blue. The winner will advance to the next round and will perform a pattern again against the next opponent and so on until the final round. 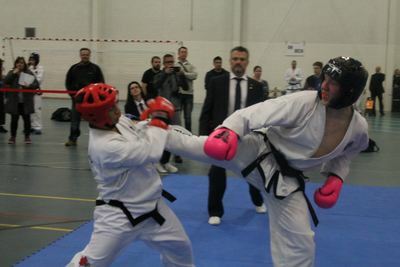 Sparring: ITF sparring rules apply. Single elimination to the final round. Divisions will be by age, gender and belt level. Division of 2 or less will be folded into another division. Sparring gear is mandatory (hands, feet and head) as are mouth guards and groin cups (for males). Colour belts will spar 1 round of 120 seconds (2 minutes). 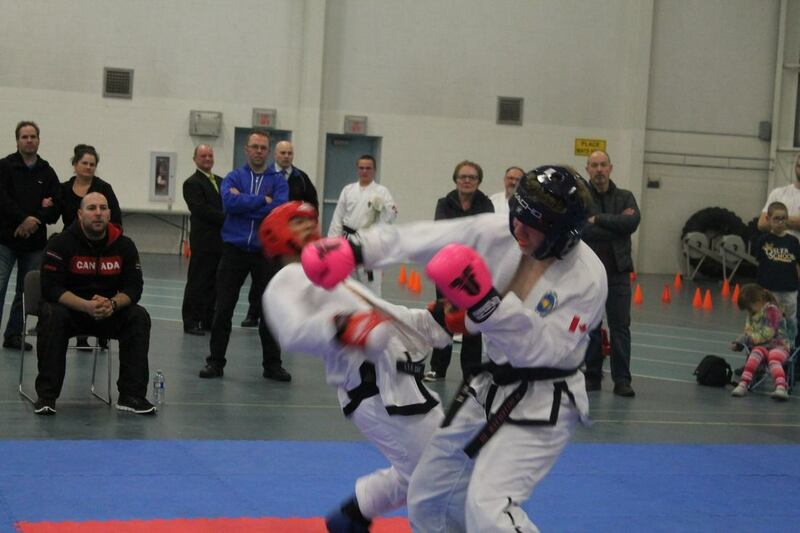 Black belt sparring rounds will be 2 rounds of 120 seconds (2 minutes) with a 1 minute break in between each round. 2 competitors are called and will spar for the designated time and number of rounds. Once finished the 4 corner judges will raise coloured flags indicating their choice of winner. The winner will advance to the next round and will spar again against the next opponent and so on until the final round(s). 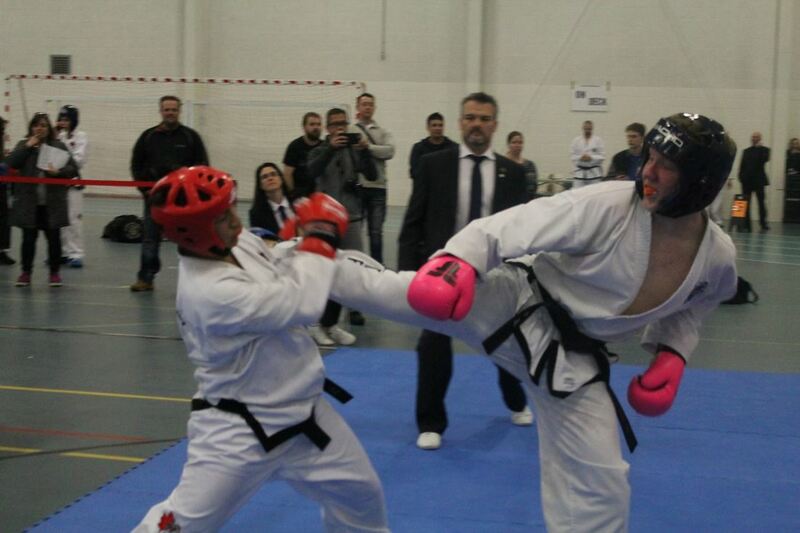 Taekwon-Do tournaments are a very different type of competition when compared to other sports like hockey or soccer. Since there are over 140 different divisions there is never a time sensitive way to schedule when a person’s group may go up to compete. There are also multiple “rings” that are working so a “ring” may come open at any time, ready for the next group. Phoenix runs the divisions from the youngest age, lowest belt, upwards through the ages and belts until the oldest age. So Shadow Warriors are first followed by any non Shadow warriors aged 6,7 or 8. 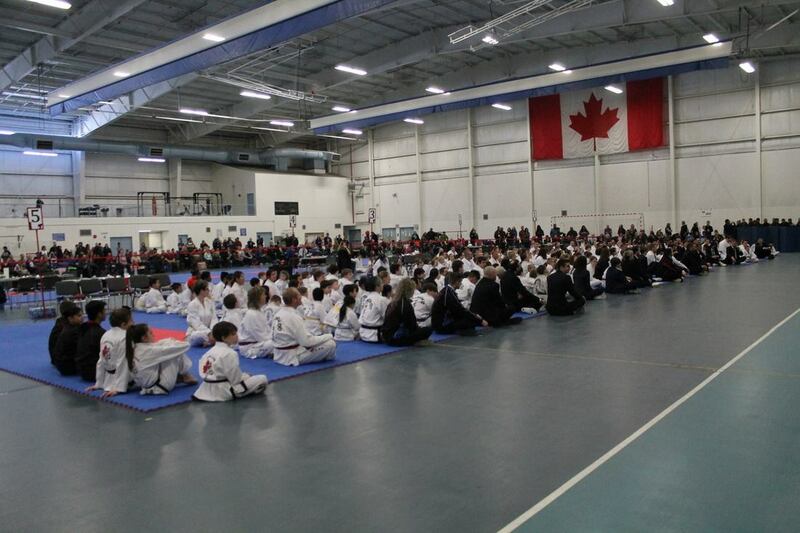 These 6, 7 and 8 year olds would be called with the white belts going first followed by yellow and then green. 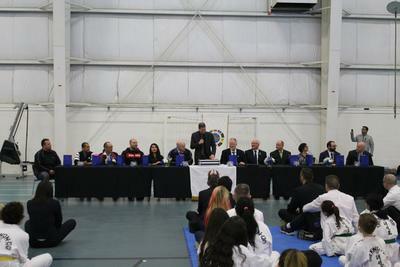 After these divisions the next age group, 9, 10 and 11 would be called with the white belts in this age group going first followed by the yellow belts then the green belts etc. Knowing this order of events allows you to at least see if you are close to being called to the on deck area. Listen to the age group and belt and you will know how close you are to being called. Competitors are called to the on deck area and then taken to the first available ring. Bring your sparring gear to the on deck area when called. The only exception to this rule would be if your division has been folded into another due to low number of entries. You would be placed into another division, possibly a different belt level or possibly a different age level. This list of “folded” competitors would be at the on deck area and announced throughout the day. You can download and email the registration form back to the admins until Wednesday March 6th at midnight.